Although no additional live drive events are scheduled in Paulding County, you may still make a donation – make checks payable to Christmas for Kids and mail to the Mix 98.1 station at 118 Clinton St., Defiance OH 43512. You may designate in the memo portion of the check which county you wish to donate to. 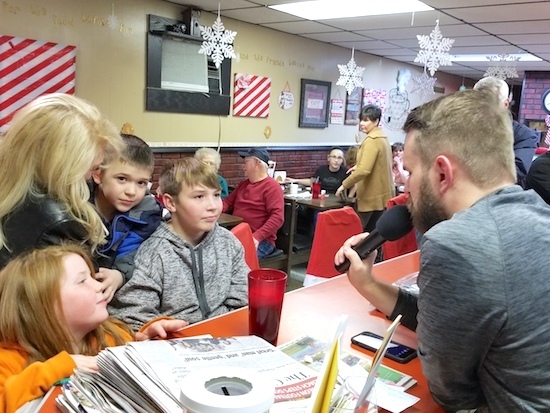 OAKWOOD – Josh Nagy, afternoon host from Mix 98.1 Radio Station hosted a “Live-Drive” Broadcast from The Oak Leaf Diner in Oakwood on Wednesday night, Dec. 5. Every year for the past four years, Oakwood Mayor Brian Ripke, owner of The Oak Leaf Diner in Oakwood has hosted a “Live-Drive” Broadcast with Mix 98.1 out of Defiance. 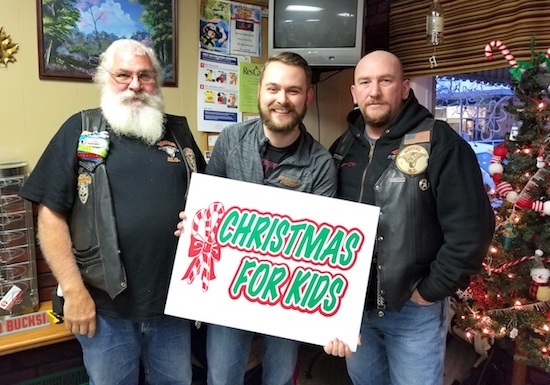 It is a joint fundraising effort sponsored by Mix 98.1 Radio Station and the Twin Oaks United Methodist Church in Oakwood for the Christmas for Kids. All of the money and toys donated to the Oakwood Live-Drive event provides Christmas gifts for children who live in the Oakwood School District (ages newborn to 18 – or still in high school). This year, a total of 84 children in 30 different families will benefit. Paulding County EMA director Ed Bohn stood outside in the cold directing traffic and taking donations. Fun fundraising events included $1 tickets for a chance to throw a pie in Ronnie Coleman’s face and bags of homemade chex mix for $2. The restaurant workers even donated their tips for the evening to the drive. Nagy interviewed several community members including local children Dawson Bradford, age 12; Dyllan Bradford, age 6; and Alannah Jeffery, age 9, who brought in 15 new toys and donated $20. The restaurant was completely packed for the entire two hours of the live drive.